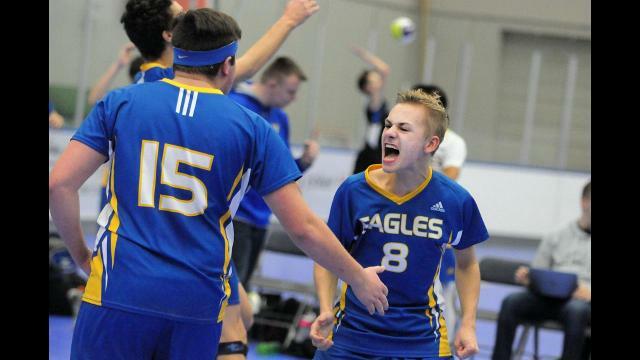 Nov. 29, 2017 7:55 p.m.
Day one is in the books at the BC high school boys provincial volleyball championships. And the defending AA champions from Langley Christian had a stellar first day, winning Group A with a perfect 3-0 record. The Lightning won all three matches without dropping a set. The championships are being hosted at the Langley Events Centre. The George Elliott Coyotes — the Okanagan champions — took second in the group, with the Abbotsford Christian Knights and Duchess Park Condors third and fourth respectively. Pool B was won by the Richmond Christian Eagles, the Lower Mainland champs, with the Prince Charles Bulldogs in second, the College Heights Cougars third and the MEI Eagles fourth. The Gulf Island Scorpions — the top seed from Vancouver Island — won Pool C, with the WL Seaton Sonics third and the Sir Charles Tupper Tigers fourth. And Pool D saw another ‘hometown’ team prevail with the Langley Fundamental Titans beating out the Sa-Hali Sabres for the top seed. The Mark Isfeld Ice finished third and the Smithers Gryphons coming in fourth. The teams have now been re-seeded and the round of 16 kicks off on Thursday (Nov. 29) morning. And over on the 20-team AAA boys tournament side, the Mt. Baker Wild won Pool E with the Dover Bay Dolphins (Pool F), Elgin Park Orcas (Pool G), Seaquam Seahawks (Pool H) and Reynolds Roadrunners (Pool I) also winning their respective groups. The Semiahmoo Totems — the defending provincial champions — placed second in their pool behind Dover Bay, while Okanagan Mission and Mount Boucherie rounded things out. Earl Marriott finished runner-up in Pool E to Mount Baker, while Delta was third and Oak Bay fourth. In Pool G, which was won by Elgin Park, Argyle, Kelowna and Royal Bay came second to fourth. Penticton finished behind Seaquam in Pool H with Vancouver Tech third and Claremont fourth. And in Pool K, Burnaby North was behind only Reynolds, while Centennial was third and David Thompson fourth. The action resumes at 9 a.m. on Thursday. Thursday will also mark the opening of the senior AAAA girls provincial draw, which features the defending champions from Belmont.